Class D Regional. Weds, March 14, 2018 in Cadillac. 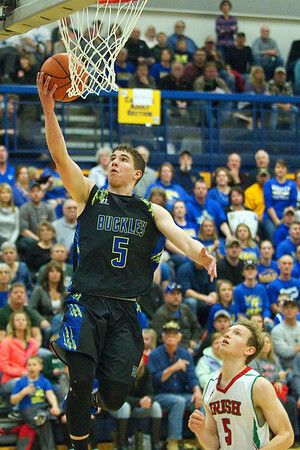 Buckley's Joey Weber (5) scores on a layup over Mt. Pleasant Sacred Heart's Zach Wentworth (5) in the fourth quarter of Wednesday's class D regional final in Cadillac.